Sofia Khan is Not Obliged by Ayisha Malik (Bought) - "Brilliant idea! Excellent! Muslim dating? Well, I had no idea you were allowed to date." Then he leaned towards me and looked at me sympathetically. "Are your parents quite disappointed?" As her woes become her work, Sofia must lean on the support of her brilliant friends, baffled colleagues and baffling parents as she goes in search of stories for her book. In amongst the marriage-crazy relatives, racist tube passengers and decidedly odd online daters, could there be a a lingering possibility that she might just be falling in love...? From Goodreads. I absolutely loved Sofia Khan is Not Obliged by Ayisha Malik! This book is such a breath of fresh air! So funny and addictive, I couldn't put it down! This book is at once no different and pretty different from other romcoms out there. Sofia is Muslim, and her faith is an important part of her life. She's a hijabi, she prays five times a day, she fasts during Ramadan. But there are other parts to her life, as well; her family, her friends, her job. She's just like the rest of us; she worries about her weight, she has to deal with well meaning but interfering family members, she's under pressure from her employers, and is trying to work out the baffling creatures that are men. Sofia is a Muslim, and she's a woman like all other women. To be honest, I think I related to her more than I've related to any other woman in romance/romcoms, despite our differing beliefs. This is a romance, and with Sofia being a British Pakistani Muslim, there are cultural differences when it comes to dating and love. I found it amusing that Sofia was writing a book on Muslim dating, when this book itself is all about Muslim dating. She's just split up with her fiancé, not only because he expected her to move in with his parents (and his brother and sister-in-law, and their children) after they were married, as is cultural tradition, but because his parents house also has a hole in the wall, joining it to the house next door, where his sister and her husband live. Her parents are dumbfounded that she would end this relationship, simply because of who she would live with. She was going to be married, and now she's single. Sofia is 30, and single. Marriage is hugely important to her parents and extended family, and Sofia being single at 30 is not only odd, it's worrying. It doesn't help that her sister is getting married in a few months time, and will be moving in with her in-laws. But now she's working on her book, and for research, Sofia has met a guy through online dating, and although they say they're just friends, Naim keeps saying things that are at odds with his behaviour, and Sofia can't work him out. Her close friends are also having relationship dramas, too. Hannah is in love with a man who is already married, and is considering becoming his second wife. Fozia is in a relationship with a guy who's parents aren't too keen because she's a divorcee. And Suj is dating a black man, and though she's not Muslim, this isn't something her father would be ok with. I loved the close relationship Sofia had with her girls, and how we got their stories as well as her own. This is a romcom, but there are people who are unhappy. This book educates readers of aspects of Pakistani and Muslim culture, but Sofia definitely has her opinions. She doesn't really think Hannah should become a second wife, she doesn't believe she will be happy. She thinks Fozia should leave her boyfriend and find someone who won't let their parents dictate to them. And she thinks Suj should just be with the man she loves and be happy, no matter what Suj's father may think. But at the same time, she can't necessarily voice her opinions, because these are her friends and she has to support them in their decisions. I loved Sofia's parents, too, and how heartbreaking they were. At first I thought their bickering was their way of showing affection, but there's a lot of history to their relationship, and they're actually in an unhappy marriage. And yet despite this, they're still eager for Sofia to get married, because they want to see her settled and happy. And the romance! I loved the romance. I have to say, I knew who Sofia would end up with as soon as he first appeared in the book. I was shipping from the beginning, simply because I wanted to be right, and then shipping as the story progressed and it all just started making perfect sense. And I'm so happy about it all! I want to go of on a slight tangent here. I want to share something from the book, where Sofia's boss is talking to her about her Muslim dating book. This made me so angry. Because this is publishing at the moment. On Twitter, I'm constantly seeing how authors' stories have been rejected because publishers don't find them relatable enough. Yet Sofia Khan is Not Obliged is a perfect example of why this is such crap. Sofia is a British Pakistani Muslim, I am a white atheist, yet I found I have more in common with Sofia than I don't; I'm the same age as her, I still live with my parents, I'm single, and I may not suffer the same pressure from family to get married as she does, but I still feel like I'm not at the stage in my life that I should be. And just of being an everyday woman, Sofia Khan is perfectly relatable. Books that feature characters who aren't white, cishet, non-disabled, middle class, Christian/atheist are still relatable. And white, cishet, non-disabled, middle class, Christian/atheist people shouldn't be the audience publishers are thinking of - the audience publishers should be thinking of are people. All people. But you know, although that quote made me angry, I was also holding a book about a British Pakistani Muslim in my hand that had been published. It was like that quote in this book was a little dig from Malik at those who think diverse books aren't relatable. They are so wrong. Anyway, back to how awesome this book is... It's just brilliant. I loved Sofia, I loved her story and those of the other characters. It was an eye-opener, but it was also funny, clever, at times heartbreaking, but completely wonderful. I am so excited to read the sequel, The Other Half of Happiness, and see where Sofia's story takes her next. 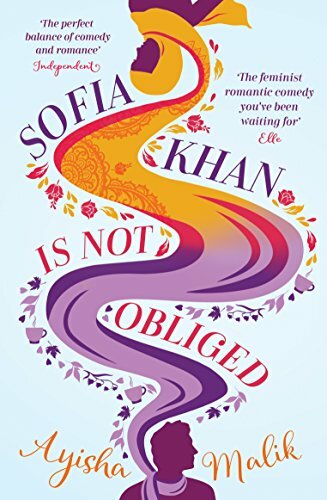 Sofia Khan is Not Obliged by Ayisha Malik has been reviewed as part of the Ramadan Readathon.